Pool Sharks, bashers and snooker players come along and play in our friendly Pool tournament. 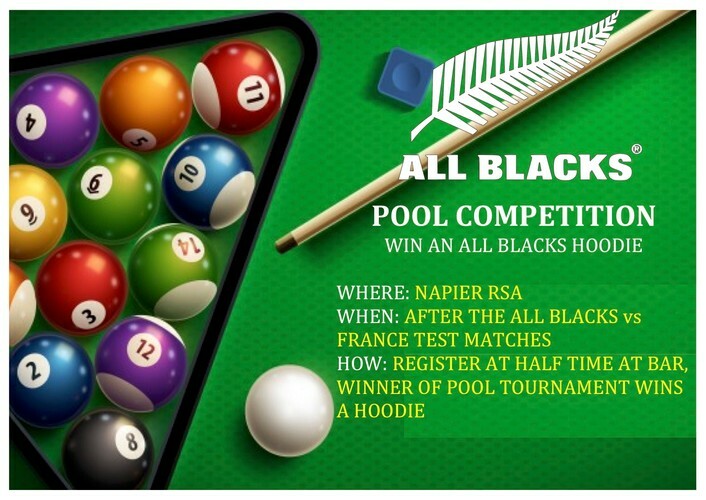 Free to enter, register at the halftime of the All Blacks V France games. We have a few spare All Blacks jackets and hoodies, and the winner on the night can pick which one they would like. Part of the fun is everyone is welcome to come and watch the All Blacks V France games free on our BIG Screens. We have a great range of options for meals and drinks. As part of the Sale and Supply of Liquor Act, we are only able to sale and provide alcoholic drinks to those who are members of Clubs or guests of members. If you're not one of those we have some great options available which could get you in the draw to win a Brand New Suzuki Swift, check it out when you come in.